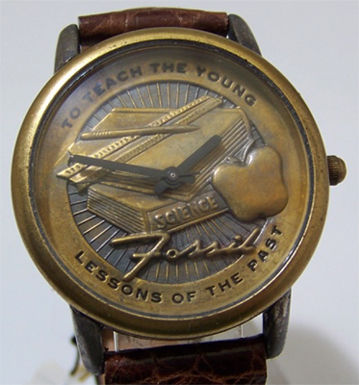 Click the button below to add the Fossil Teachers Watch Vintage Educators Collectors Novelty Wristwatch to your wish list. 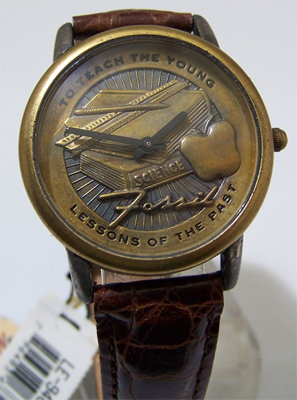 Fossil Teachers Watch Vintage Educators Themed Wristwatch, New working. Rare Classic Fossil Collectible in vintage tin. Fossil Teachers tribute watch, Sold Out Classic style Fossil Limited Edition Collectible wristwatch with Educator related images in 3D raised brass. 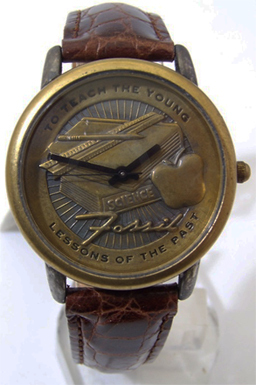 Desk, text books ruler, pencil, even an apple: Fossil name on watch face, with stainless steel case back. Sold out Unworn vintage wristwatch in working condition. Fossil unisex sized novelty collectors watch on a rare Fossil brown leather band. 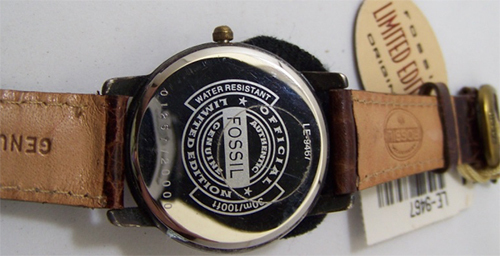 This is a Rare sold out item with classic Fossil vintage design. Case size: 36mm, Band width: 18mm, mineral crystal, three hand analog display with quartz movement. 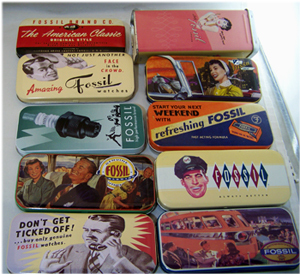 Ships in a vintage collectible Fossil tin-- Tin may be different than the samples shown below.